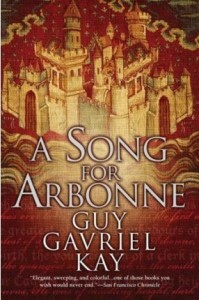 Kay’s follow-up to “Tigana” was “A Song for Arbonne”, another stand-alone historical fantasy novel set in a similar but distinct Fantasy world. This time, the setting is based on medieval Provence, most of the action taking place in the Kingdom of Arbonne, a relatively pleasant feudal country under the influence of the benevolent priestesses of the Goddess Rian. Arbonne finds itself under threat from its Northern neighbour, the more warlike country of Gorhaut, which is dominated by the misogynistic priesthood of the war God Corannos. Offended by Arbonne’s worship of a female deity the Machiavellian High Priest Galbert manipulates the avaricious King Ademar into invading Arbonne. The rulers of Arbonne know that an invasion is possible, but their preparations are continually disrupted by the endless feud between the country’s two leading Dukes, Urte de Miraval and Bertrand de Talair who have hated each other since Urte’s wife died in mysterious circumstances shortly after Urte’s discovery she was having an affair with Bertrand. The book’s main character Blaise finds himself caught in the middle of this after agreeing to work for Bertrand. Blaise is a mercenary working for hire after leaving his homeland of Gorhaut in disgust at the actions of King Ademar and the manipulations of Galbert, who is Blaise’s father. Blaise soon finds himself increasingly liking the lands of Arbonne and admiring his new employer, Bertrand, who is a famously prolific writer and performer of songs as well as being one of his country’s leading nobles. The bohemian lifestyles of Arbonne’s troubadours, who are regarded as a crucial part of the country’s culture, is one of the more obvious aspects of the difference between Arbonne and the relatively grim lands of Gorhaut. The plot isn’t quite as ambitious as in Tigana, instead this is essentially a relatively simple tale of Arbonne striving to defend itself against its more aggressive neighbour. There are plenty of complications, naturally, particularly focused around the novel’s main theme of the contradictory demands of family, personal beliefs, and loyalty to one’s country, epitomised in the struggle between Blaise and his domineering father and drunkard brother and in Bertrand’s and Urte’s feud which threatens to do so much damage to their country. Although the setting is again vividly described, the best bit of the book is the characters. Blaise is a very likeable hero, but also a realistically complicated character, not being anywhere near to being a simple hero although perhaps not quite as morally complex as Alessan in Tigana. The supporting characters are also interesting and believable, Bertrand in particular is an interesting character, admirable in most ways but with some very human flaws which cause a lot of problems. Compared to Brandin in Tigana, the villains are a bit more simplistic, they don’t really have any obvious good points, but their motivations are at least believable. The story is compelling and the quality of the writing again high. Arguably, this doesn’t have quite as many truly great scenes as Tigana and the novel doesn’t have quite the same ambition but it is still very entertaining to read and doesn’t really have any significant flaws (although again the plotting seems a little bit contrived at times in the way that all the major characters in the war have so many connections between them). In summary, “A Song for Arbonne” is an excellent Fantasy novel with a compelling story that lacks some of the ambition of “Tigana” but it is still a very good read. Excellent review, and the comparisons to Tigana are spot on.